Pluto is good for your health? This is a chart for the signing of the "Affordable Care Act" more commonly known as "Obamacare". Libertarians and conservatives know it to be an economy-wrecking giveaway of taxpayer dollars to the entrenched powers in the healthcare industry. Liberals, Neptunian to the end, are generally in denial. The legislation has already started a hemorrhage of jobs in the country due to employers making preparations to comply. This is probably why the Overlord himself has just postponed the employer-mandate portions of the bill until after mid-term elections (another explanation is that the government is nowhere near completing the infrastructure to handle the law). Even without going into my own methods for parsing political charts, this chart is frightening. The Sun-Moon-Saturn-Pluto grand cardinal cross is impossible to miss. The Sun and the Moon are long-accepted traditional indicators of health. Astrologers generally see Saturn and Pluto as the great malefics of the horoscope. Saturn hardens, constrains, and blocks those energies with which it interacts. Pluto causes them to undergo fundamental, often violent changes or even death. 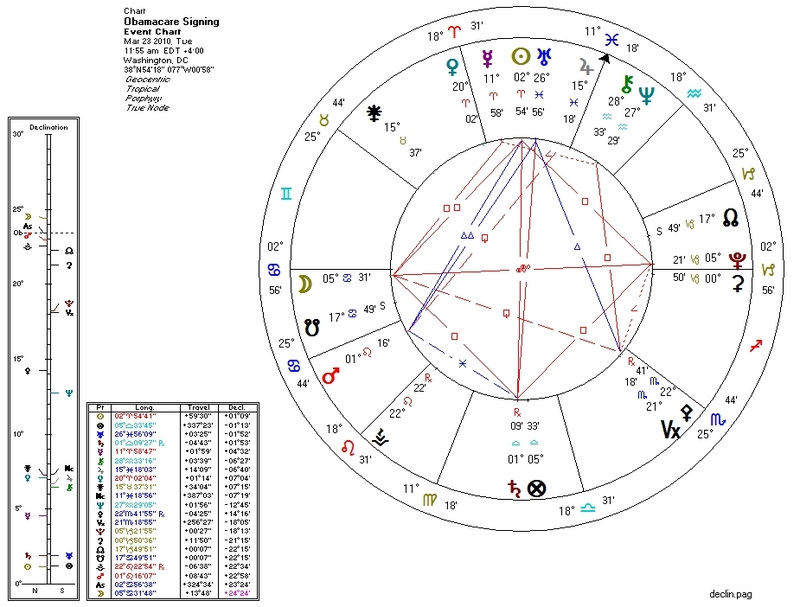 By this configuration alone, we might suspect an effective political revolutionary (especially with Uranus on the Sun) -- but we would be truly insane to trust this chart with our physical health. Chiron conjunct Neptune in the Ninth House of publicity gives us a beautiful dream of national healing. Their semisquare with Mercury tells us a deception may be afoot. The Moon in Cancer on the Ascendant presents a caring, nurturing face. Opposite the Moon on the Descendant, deadly and secretive Pluto brings death to the chart's partners (us) and hints at the hidden corporate forces that will reap massive rewards from this legislation. The Nodes compound this story. The South Node in the First House in Cancer opposite the North Node in the Seventh House in Capricorn suggest that power will leech from personal health and well-being to the corporate partners that the bill is actually intended to benefit. Jupiter, ruler of most of the Sixth house of health (and the general public in mundane astrology), is visible at the Midheaven and dreamy in Pisces but peregrine with no Ptolemaic aspects: high and dry. That is, unless we count the irritating and combative sesquiquadrate from Mars, in the Second House of finance. Mercury in the Tenth House rules the Fourth House, (which in mundane astrology represents the opposition to the party in power) and much of the Twelfth House (of secrets, etc.). 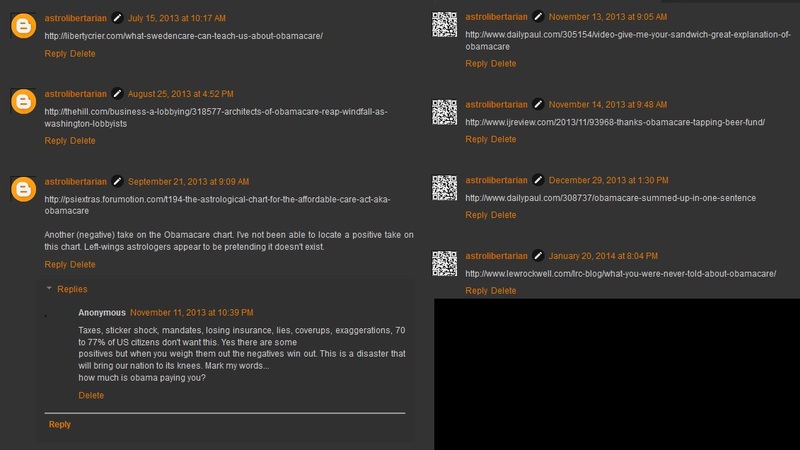 This reflects the "open secret" that Obamacare was originally invented, promoted, and implemented by Republicans in blatant violation of conservative ideals. My own political-analysis methods help complete the picture. Pallas carries corruption via a semisquare with Pluto. Pallas' co-ruler Mars is sesquiquadrate Jupiter, an ethics-blocking effect. That Mars is also trine the Sun may mitigate the damage, but this is still a solidly authoritarian chart. A Left-wing affiliation shows up as the Moon (ruler of the Second House and arbiter of culture) widely conjunct the South Node and widely trine Neptune. Pluto, again, opposes the Moon and widely quincunxes Mars, ruler of Venus. Pluto with both the Moon and Venus is a feature which very often appears in feminist charts (more on this in the future). The original bill, before later amendments, was friendly to abortion. 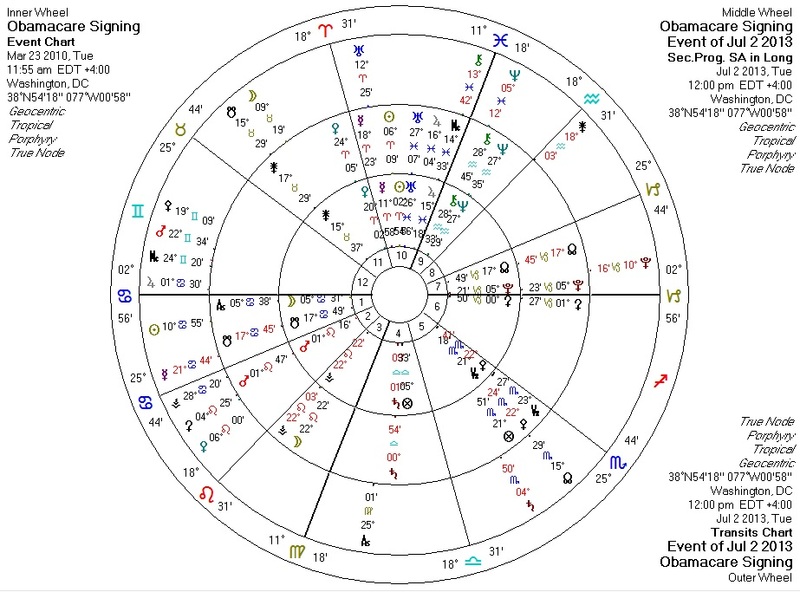 This is the same chart including transits and progressions for July 2, 2013, when the White House announced a one-year "stay of execution" regarding the law's employer mandates. Transiting Uranus is conjunct Mercury: a sudden surprise announcement. Transiting Jupiter is crossing the the Ascendant, breathing new life to the monster. Transiting retrograde Saturn trines the Ascendant and Moon: a pullback which will help keep the law from imploding too quickly. Transiting retrograde Chiron is conjunct the natal Tenth House Jupiter: repairs or adjustments regarding publicity. Pallas, ever important for anything involving ethical or strategic considerations, receives a square from the progressed Moon, a trine from transiting Mercury, and a quincunx from transiting Mars. Mercury with Pallas is a libertarian factor, in this case a temporary loosening of the force of the bill. In this day and age of massive and unsustainable government expansion, any good news like this, however temporary, is welcome.